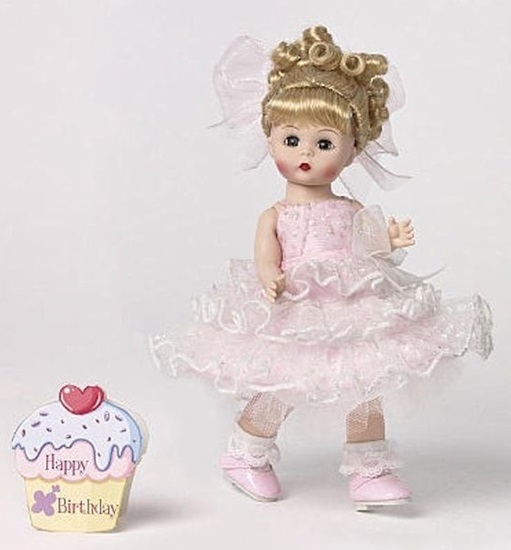 New in the Spring of 2014, "Happy Birthday To You" is an 8-inch fully articulated Wendy . Her beautifully sculpted face, rosy cheeks, and classic rosy puckered lips are an iconic Madame Alexander feature. She looks ravishing in her pink taffeta party dress with sparkle tulle ruffles. With her dress she wears a petticoat, bloomers, and pink patent Mary Jane shoes. The perfect gift to celebrate a special birthday, she comes with a cupcake birthday card! Her beautiful blonde curls are styled in an upswept hairdo with a pretty pink sheer bow.